Have I mentioned how much I love indoor/outdoor spaces? Maybe because often, I love the idea of dining al fresco more than the actual experience. Restaurants that bring all that is lovely about being outside, into a more refined and controlled environment gives you the best of both worlds. 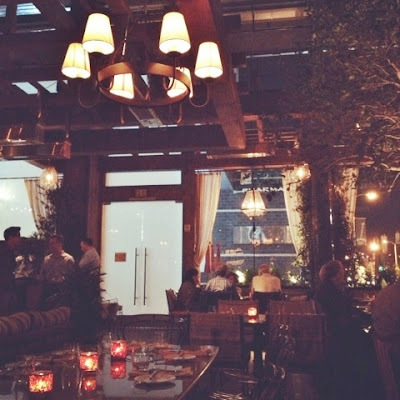 So I was excited to be invited to check out the recently opened RivaBella in West Hollywood, featuring an 8,000 square foot dining space described as "rustic Tuscan" AND chef Gino Angelini of locally beloved Angelini Osteria - creating an anticipated pairing of style and substance. It was a pretty breath-taking space from the moment you set foot inside the main dining room, with its soaring ceilings, sleek, sophisticated woods and elegant greenery all around including several manicured trees between sections of tables. And a wine cave with arched brick ceiling! 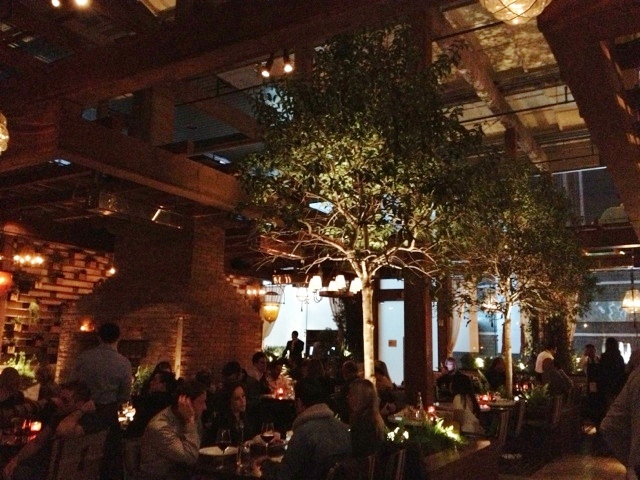 The roof is retractable, for when the signature SoCal sunny weather returns. In terms of ambience, this place is perfect for date night or that Hollywood power lunch. The crowd on a weeknight? If there was a Housewives of Hollywood Hills - this is a place where they might often be spotted. There were also lots of beautiful people in their 30s, 40s and up, dressed to impress. 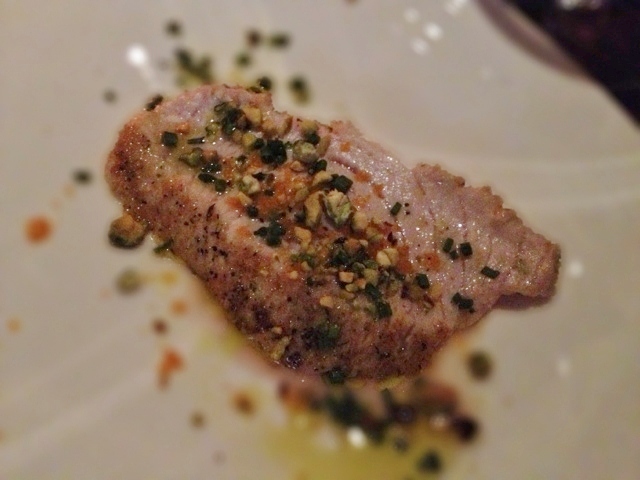 Our tasting started with an off-menu item: Seared Swordfish with Bottarga - personally, I'm not a big fan of swordfish, but those who are would say this is a nicely seared piece - and who doesn't love bottarga! 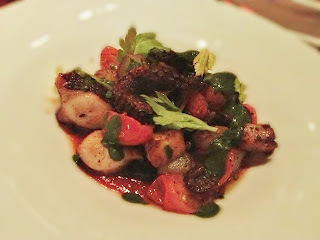 One of the most unforgettable dishes of the night was the Roasted Octopus Salad ($21 on regular menu - image shown is sample sized for tasting only) with potatoes, Taggiasche olives, salsa verde - the octopus was roasted perfectly, nice crisp clean smokey charred exterior opening up to incredibly tender, flavorful meat inside. 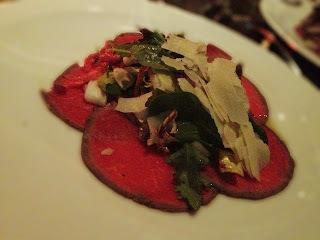 Loved the use of potatoes to soak up the amazing juices and for a different type of crunch, while the brininess of olives and acidity of tomatoes helped cut through the heft of the proteins and carbs. We were then generously treated to another unscheduled dish, Eggplant Parmagiana ($14 full size on regular menu) the chef's own modern interpretation of it topped by delicious flash-fried eggplant skin! Where's the pasta, you say? 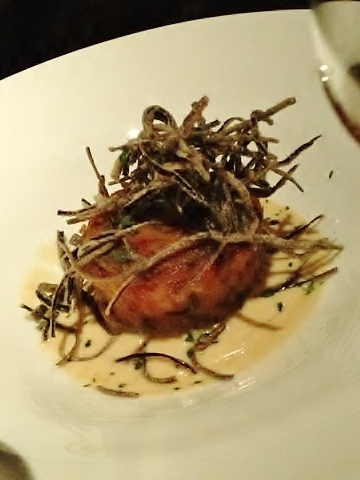 It came in the form of the showstopper for the night in my opinion: Nidi di Rondine nested pasta with Italian ham and parmagiano cream ($17 full size on regular menu) - I have never seen pasta presented this way, wrapped like a Jewish deli roll, but with layers of freshmade noodle around delicious, juicy ham. 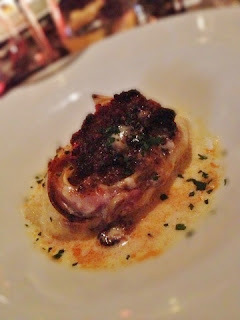 The 'roll' is then topped by amazing veal and wild boar ragu that I think must have been wine-braised (for great depth of flavor that is instantly addictive) and baked onto the roll with a nice slightly crunchy crusty texture. The parmagiano cream sent me over the edge - I couldn't even pause for breath, I loved this thing so much and only wished I could have ten more. This one was my favorite of the night, hands down, and one I would definitely have to go back to RivaBella for, especially since at $17 for an entree sized dish, it's not a bad deal at all either. 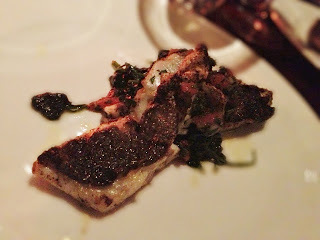 Grilled Filet of Branzino with Sautéed Spinach and Sicilian Style Sauce I didn't see this on the regular menu posted online. Not the most impressive plating, nor game changing execution, but a tasty piece of fish and 'safe' choice for date night. 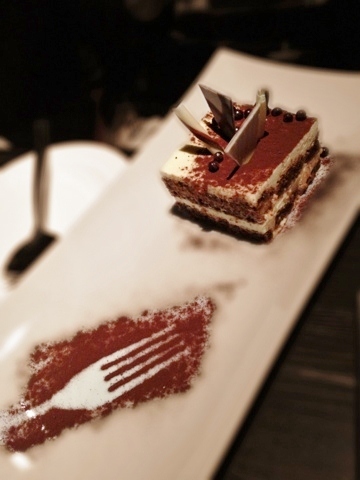 ...and the Tiramisu with a silhouette of a fork reversed into cocoa powder. In terms of taste, the tiramisu was a solid execution of a classic. The others weren't very memorable and were not something I would crave and make a special trip back for. While we were finishing up, we noticed several tables around us with guests celebrating birthdays - it was cool for us to see the waitstaff bring out treats with sparklers, showing that despite our inital assessment of the 'scene' here, that at least the restaurant doesn't take itself too seriously (even if some of its patrons do). All things considered, RivaBella successfully delivers with upscale, event dining ambiance paired with some fantastic dishes and great people watching. A nice addition to the WeHo area! Many, many moons ago, my family spent a few years in Canada. I remember the visual beauty of seasons: fluffy mops of maple trees burning brilliant against crisp blue skies; waking to our yard and street blanketed in pristine, glistening white - as if inside a snow globe that settled overnight. I remember tunneling through snowbanks shovelled off to the sides of our driveway, with my brother, making 'igloos', snowmen, snow angels. What I can't remember was what it actually it felt like...those subzero temperatures. And sorry, Seasons lovers - for me that's an incredibly good thing. Having lived in California so long - being spoiled by year round comparatively great weather - I can't imagine - no, I can't live anywhere else after this. (Well, except maybe the Maldives, if I finally win that lotto jackpot...). Each February-ish though in LA, when temperatures do drop to the 40s and 50s, it already feels like death to me (hey, everything is relative...that's freezing compared to our otherwise endless summer). Everyone gets sick around this time, and somehow I always manage to dodge the bugs on the first few go arounds. Apparently my body likes to wait til the virus mutates and/or right before I need to travel, before I succumb to a superbug, for maximum trauma. This year was no different - it hit me on third pass, and hard. Except that I've made some amazing foodie friends through this blog - who were able to steer me away from the canned soups and Jerry's Delis of the world...to sick food that truly heals body and soul, with tastes of home. 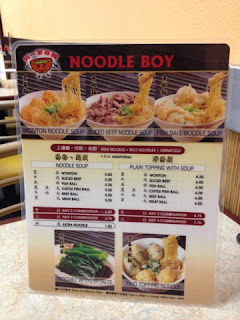 Noodle Boy, a recommendation from well travelled, super knowledgeable Hong Kong transplant miffyeats, was a no frills place in a strip mall in Rosemead, that is as authentic to a Hong Kong wonton noodle joint as you can get in LA. These places specialize in a few variations of their signature dish, and take pride in doing so. Noodle Boy, as the name would suggest, knows noodles and they do it well. In terms of menu format, you can almost think of it as the Hong Kong-ese version of In-N-Out, with straightforward offerings that riff on basically the same items in different combinations. I went for the "Any 2 Combinations" Noodle Soup ($6) with Wontons and Fish Balls. 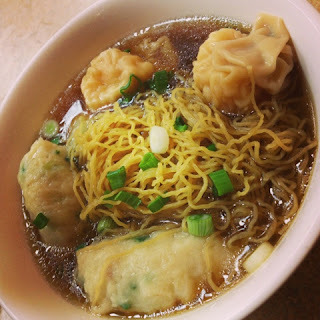 A hearty bowl with clear, soul-soothing, clean tasting broth, thin egg noodles the way I like 'em with my wontons. It'd been a while since I had fish balls (no, not offal sea creature gonads, but more like savory 'cakes' made of ground up fish) - and Noodle Boy makes theirs with scallion and other deliciousness mixed in: very light, flavorful yet filling in large rectangular slabs versus the more traditional small spheres. While I loved the fish balls, the wontons were the true standouts - you can definitely taste that the wrappers are fresh made, soft and pliable, with super fresh, snappy pieces of shrimp as filling - I felt better on contact with every bite and slurp of the contents of this bowl - and only wish I had stomach space for 3 more. They also have the wider, flatter white ("fun") noodle option, as well as sides of veggies - which I may try next time, though I hear that nothing measures up to the quality of those wonton + egg noodles. Delicious Food Corner was a recommendation from my Go To expert on all things SGV (and beyond), Sinosoul - when I heard that the Cantonese / Hong Kong-ese contingent tend to flock there for congee, I had to make a trip out to the SGV to check it out. Yes, rice porridge is in theory an easy DIY - but when you're sick, and single, you just really don't want to have to do anything that requires any amount of work in the kitchen - and it's NOT easy to do congee RIGHT. 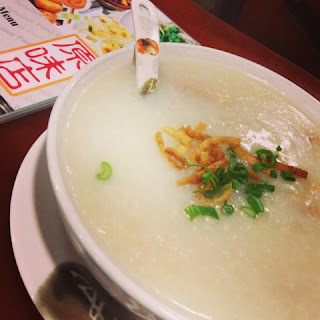 Really good congee takes hours to cook, and has a smooth, soothing consistency with evenly infused flavor. Plus, I love abalone in congee, and that's not something I can easily get at markets outside of the SGV anyway. DFC has several different kinds of congee (including "Pig Offal" and one with pig kidney and liver, which as Cantonese/ Chinese people 'know', nourishes the corresponding organs in the eater). I was torn between two classic favorites: Pork and Preserved Egg ($6.25) and Abalone and Chicken ($8.50). Since it was only $2.25 more for the abalone, and I was in the mood for it anyway, I went for that one. Loved every spoonful of this 'jook' - testament that sick food doesn't have to be bland and soul-crushingly boring. Also, the abalone came in fairly sizeable slices, unlike some Ktown eateries that I love for its flavors but make their abalone portions barely detectable. 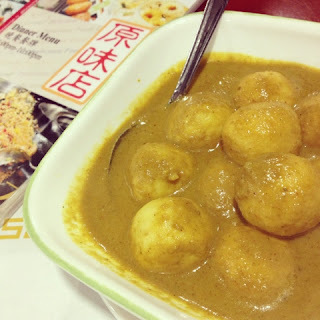 Aside from an extensive offering of congees, DFC also has a pretty big menu of Hong Kong style dishes including one of my favorite street foods growing up, curry fish balls! Except that they serve it in a bowl, and you have the option of fish and/or squid balls! Since this was a few weeks after Noodle Boy and I was just at the beginning of another bout of cold, but not yet full blown, and not spice averse - I got the combo bowl - the somewhat unfortunately translated Curry with Mixed Two Ball ($5.95). These are more like savory cakes, as explained in the Noodle Boy report above, but in the traditional sphere shape, and dunked in curry sauce. The balls were...for lack of better adjective...springy....But the texture of the sauce was a bit too grainy and starchy for me, and I would have liked to see the spice more pronounced - but for a nostalgic taste of home, in a generously portioned bowl, it put a smile on my face. By the way, DFC also serves that mythical HK cold remedy: Hot Coke with lemon (and version with ginger too). No one knows how this works - I understand the bug fighting antioxidants in the lemon, and ginger's antiseptic properties, heat to soothe congestion, but the coke (coca cola)...? Not sure, maybe just to help kids drink it all down - but we always unquestioningly drank these as kids to help with colds. The other thing I loved about these sick food places in SGV - and I may be biased / receive different treatment as a Cantonese speaker - the waitresses here sort of automatically transform into stand-in asian moms, caring enough to ask about my condition and helping me navigate the menu to find the type of congee/food that will best make me feel better, and sending me off with well wishes to get better soon. For a transplant with my family all in other time zones / countries - it's definitely nice to experience the kindness of strangers embracing me 'family style' in the SGV. I should also note for those who might be homesick / wondering where all the Cantonese people are in the SGV - at Noodle Boy / DFC both you will hear a comforting cacophony of Cantonese all around you - almost feels like you're in a neighborhood joint in HK (or warning to those who don't speak, it might be irritating). In any case, the next time I'm feeling under the weather in LA, I have two new go-tos, that I know will help get me back to functional in no time! I'd always wondered about Sushi Roku, the sushi chain belonging to the same restaurant group as BOA Steakhouse, but somehow never found my way there. 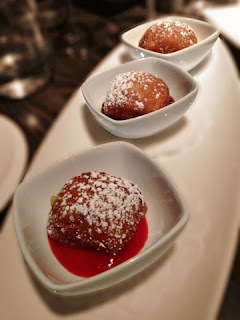 So it was nice to see an invite in my inbox recently, to a Sweet Sixteen celebration at the original location - preview of a special menu marking the 16th anniversary of Sushi Roku Hollywood's opening. At this location only, starting tomorrow March 1st through the end of the month, they will be serving a menu of special dishes and cocktails - 16 of which are $8 each, and two at $16 each. 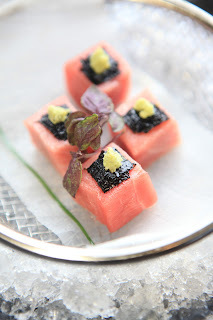 The one that jumped out at me the most, of course was the Toro Sushi with shaved black truffles ($16)! I unfortunately didn't get to try this at the preview event, but I did like the American Kobe Meatballs with mayo and karashi mustard (3 pcs for $7). · Tuna Tartare (2 pcs for $8) with caviar and wasabi root - I did try this one and the presentation was fun, in a little fried wonton cup shaped like one of those Tostito scoopers. The caviar, tuna and wasabi are all strong flavors - for those who like flavors to go 'all out'. There are also specialty cocktails, and the Lychee Imperial Martini with Belvedere, lychee & lemon sour and kefir lime leaf is very drinkable at $8. Though many of the food items are still relatively pricey, the drinks seem reasonable - and it's one option for a night out in Hollywood in a 'historic' (by LA standards, 16 years is an eternity!) venue. Plus, those who order from Sushi Roku's Sweet Sixteen menu during March will automatically be entered to win an Omakase experience for four people from Executive Chef Jiro Kobayashi.